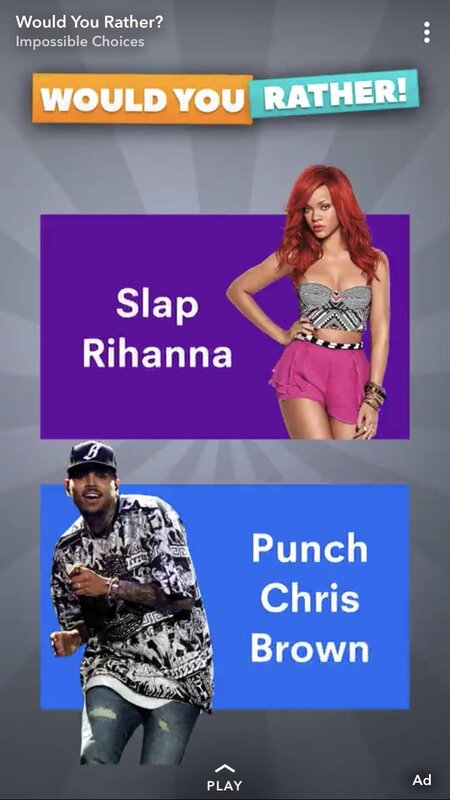 3 Comments on "OMG, Snapchat airs insensitive ‘Slap Rihanna or Punch Chris Brown’ ad"
That’s what happens when you diminish the severity of domestic violence by getting back with your abuser. She is in no place to tell women or anyone how they should deal with domestic violence. Women who did what she did are killed all the time, but then again they aren’t trying to keep their name/career in the spotlight…instead they are legitimately scared for their lives. Sit down you attention whore. When platforms are just systematically tone-deaf, it is time for them to just go away. They serve no function to society.